Indianapolis, IN – On Wednesday, January 23, Hoosiers from all across the state, including representatives from military associations, faith groups, community assistance organizations, and advocates for housing, civil rights, and survivors of domestic violence presented compelling pleas to Indiana senators about the harms of payday loans in their communities. Each called on the senators to support SB 104, which would cap the APR on small loans in Indiana at 36%. These loans are currently capped at 391% APR. 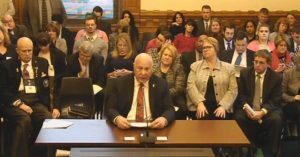 During three hours of testimony before the Senate Insurance and Financial Institutions Committee, only lobbyists for out-of-state payday and installment lenders voiced opposition to the bill. To obtain a payday loan, a borrower needs a source of income – such as a paycheck, social security, or disability benefits – and a bank account. Because the lender knows the date the customer will be paid and has access to their bank account, they can cut the line on a borrower’s other expenses. Sixteen states and D.C. have moved to stop predatory payday lending within their borders by enforcing a cap around 36%. This disrupts the debt trap business model of payday lending and ensures families are not drawn into high-interest traps. “In 2006, Congress passed a law limiting the interest rates for active duty (military) and their families at 36%. So it’s no accident that this bill that Senator Walker has is capped at 36%. If it’s good enough for our active army – the people that protect you and keep you from harm’s way day in and day out – it should be good enough to protect citizens,” asserted retired Brigadier General Jim Bauerle of the Military / Veterans Coalition of Indiana. Payday loans lead to delinquency on other bills, delinquency on child support payments, considerable overdraft fees, involuntary bank account closures, and increased likelihood of bankruptcy and foreclosure. Close to 50% of borrowers will eventually default, and upon default, will experience aggressive collection tactics and damaged credit that increase barriers to jobs, housing, insurance or other affordable products in the future. Ultimately, many borrowers turn to sources of support they could have used prior to digging a deeper hole with high-cost payday loan debt. These loans also lead to a net decrease in economic activity as lenders drain $60 million in fees each year from low-income neighborhoods. Communities of color typically have a disproportionate number of shops in their neighborhoods. “The Indianapolis Urban League supports SB 104. Indiana must do all that it can to ensure that its most vulnerable citizens, including our veterans, are protected from financial acts of emasculation,” said Mark Russell of the Indianapolis Urban League. SB 104 was held for further consideration .